Maddie is a real babe! We believe she is about 4-5 months old, and she is already proving to be a happy and confident girl. 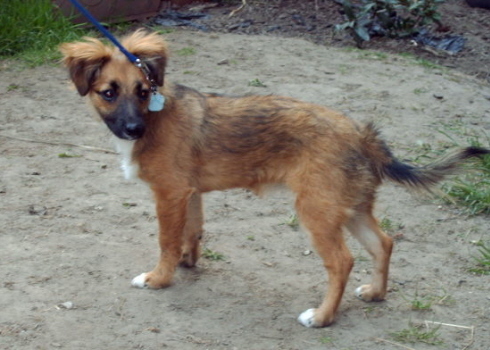 Maddie came via the pound, so little is known of her background. We do know that she was found by a member of the public several weeks ago, and taken in by them in the hope of an owner being found. When this was not the case the finder signed Maddie over and we have moved her into a foster home from where she will be rehomed. Maddie is currently living with young children, and 2 large breed dogs. 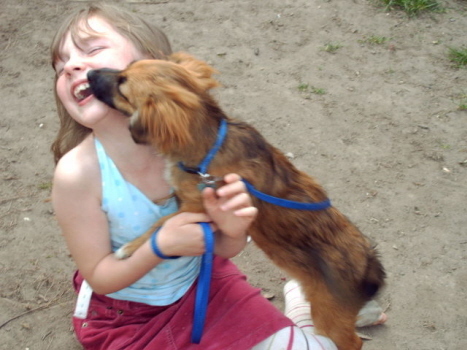 She loves the company of everyone, adores children and is confident playing with the other dogs despite their size. Maddie has only seen cats when out and about, and does bark at them, so we cannot be sure that she could live with cats without careful introduction, but as she is a puppy this should be possible with patience and careful handling. 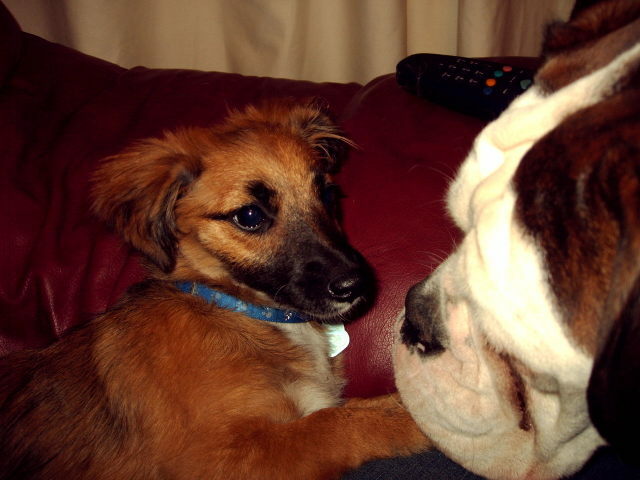 She is already responding to 'sit' and her foster carer is introducing other commands. Maddie is accepting of crate training, and does not show signs of separation issues when crated overnight in the hallway. Fed 3 times a day on a dry puppy complete food, Maddie has a healthy appetite. She loves her toys, especially playing tug of war, and does not appear to have any fears or nervousness. Not yet fully house-trained, Maddie is learning fast and has only an occasional accident. This training would need continuing. We would also expect Maddie's new owners to take her to basic puppy classes to ensure she has the basic training needed for a youngster. We are not sure what size Maddie will grow to be, and are waiting for her visit to the vet for further suggestions as to her breed mix. We will update this page as soon as further information is available. Any new owner must demonstrate knowledge of puppy training, and an understanding of the commitment involved. No full-time working homes will be considered, and someone needs to be home most of the time. We will also NOT home to families with children under 5 years of age. 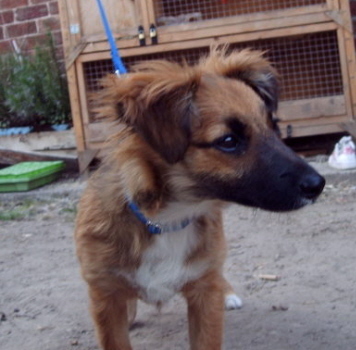 Maddie will make a wonderful companion, and we are looking for the best possible home for her. 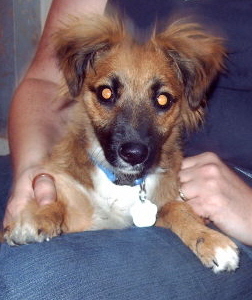 Anyone interested in rehoming Maddie needs to contact us or telephone Clare on 07929 478634 for an informal chat. If successful an adoption contract is completed and a donation is usually required. The dog will be vaccinated and microchipped. As Maddie is not old enough yet for spaying, a voucher will be provided and arrangements for this will be made once in her new home. This is part of the adoption agreement and is followed up to ensure it is carried out.